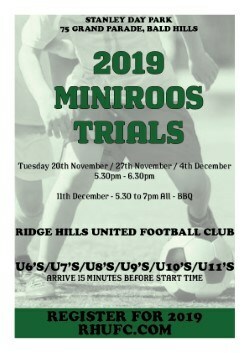 Games CancelledCoaches & Managers MeetingWORKING BEETRAINING DAYSSEASON KICKS OFF2019 Season2019 Senior PreSeason Trials2019 MiniRoo Trials2019 Junior TrialsWant To CoachFREE Development TrainingVolunteer Points UpdateSQUIRTS PROGRAMCoaching AppointmentOne Goal Program - Don't forget to mention the club! Due to the Rainfall we have had last night and the forecast for more rain today we have unfortunately had to cancel the games this afternoon. We have had to postpone our Coach and Managers Meeting until Monday 11th March at 6:30pm. Working Bee at the club on Saturday 9th March from 8am. Come on down and help give the club house a tidy up before the start of the season. If you have a rake, shovel, broom, paint brush bring them with you. 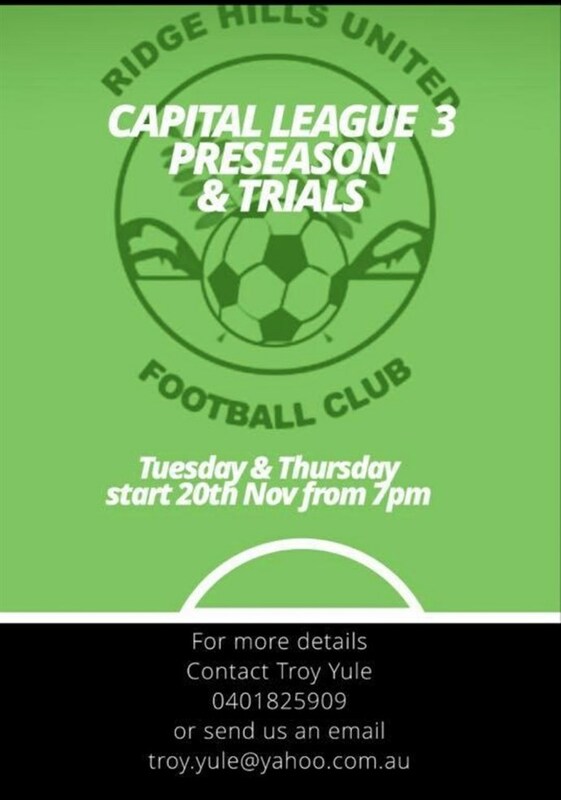 2019 Season kicks off this weekend with our Capital League Mens Teams travelling away to Teviot Downs. The Reserve teams kicks off at 5pm with the Top team to follow at 7pm. If you have some free time and feel like going for a drive come on down and support our boys. Please click the link below or come on down to the club on Saturday 2nd February between 9am and 12pm to register in person. The Club is currently planning for the 2019 season and so we are looking for people that are interested in coaching or being assistant coaches for our teams from U6’s all the way to U16’s. All nominations will require a meeting with Troy Yule and Jason Hale, who have stepped up Temporarily as DOCs (Directors of Coaching). The meetings will be held November 12th and 13th and all coach allocations announced by November 14th. 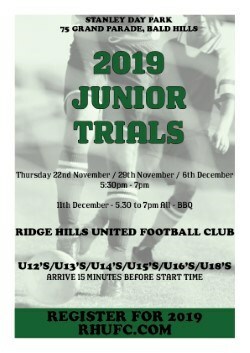 If you’re interested or have any queries in relation to this please email secretary@rhufc.comby November 9th, with full details and preferred team. Below is the updated tallies for the volunteer points for this season. 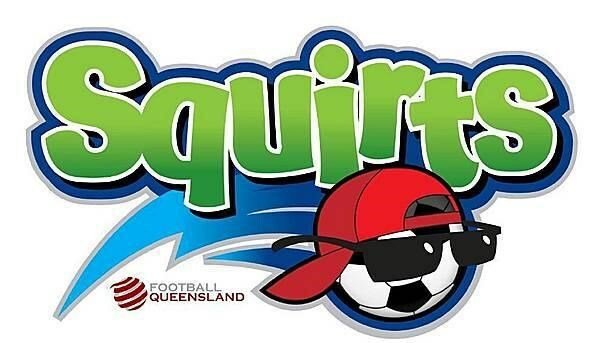 Ridge Hills United Football Club are calling for Expression of Interest to run a 10 week Squirts program for those keen little guys and gals who want to start playing Football now. Aged between 3 & 5 years we have a 30 - 60 minute training and game program. 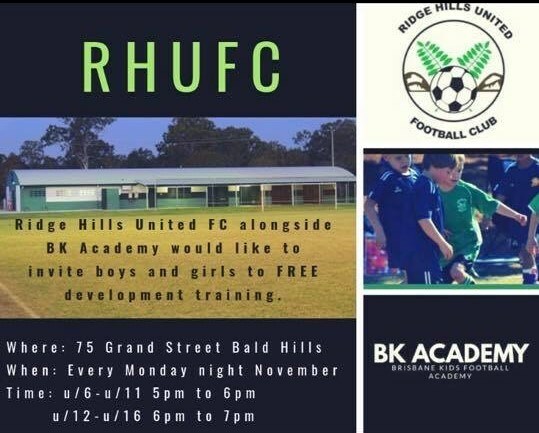 Cost is $130 for the 10 week program and includes everything they need to play (Shirt, Shorts, Socks, Ball, Shin Pads). All that stuff, plus organised play for just $100 is less than $13 a week. 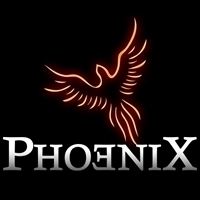 If we get enough interest, games will start early 2019. Please email secretary@rhufc.com if you've got an interested little Squirt!!! 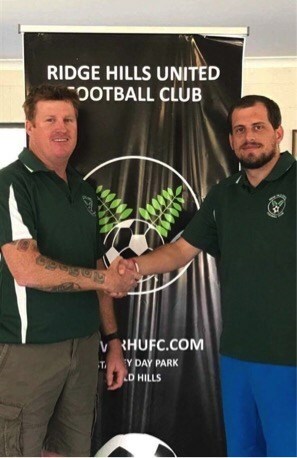 Ridge Hills United Football Club are pleased to announce that Troy Yule will be the First team coach for the Men’s Capitol League team for the 2018 season. 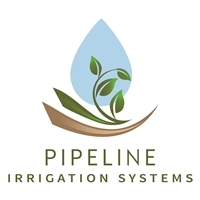 Any enquiries regarding the team please contact Troy on 0401 825 909. Further details to come about preseason training. 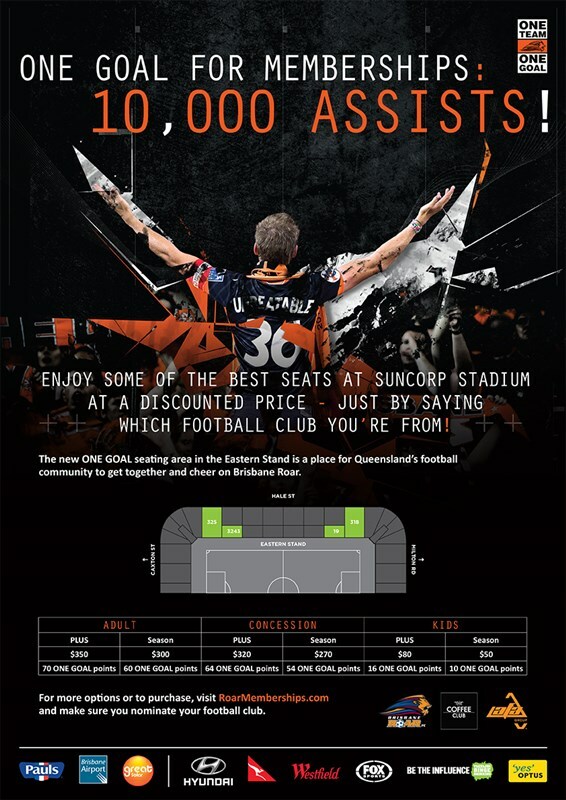 One Goal Program - Don't forget to mention the club! Prepare for an experience that was once only found in the city. Socialize and relax in the open, on modern outdoor lounges. Vibe to our BOSE surround sound system. Suspension parts and repairs for vehicles. 24Fit - Bracken Ridge No contracts. Low fees. Open 24/7.